Ben Mumberson, Donna Beggs, Narelle Lorbeer, Josh O''Neil, Nick Ansell, Sandra Ahlquist and Dave Renton at the grant presentation. 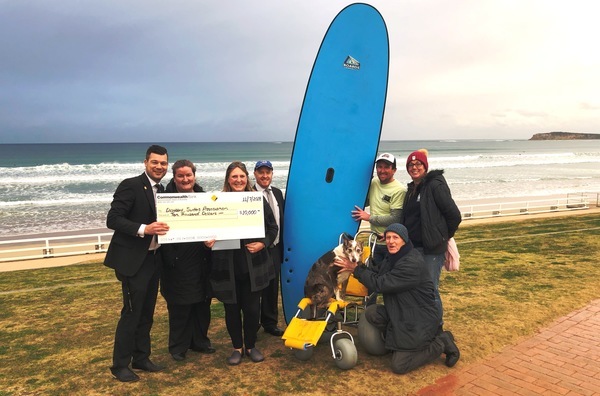 Disabled Surfers Association received a $10,000 grant from Ocean Grove’s branch of the Commonwealth Bank (CBA). The iconic surfing association, which conducts two massive events for people of all abilities each summer at Ocean Grove Main Beach, benefited from the grant thanks to CBA Ocean Grove employees. CBA employees are donating $10 million Australia-wide as part of the 100-year tradition. A total of 1000 Centenary Grants valued at $10,000 are being distributed across the country. 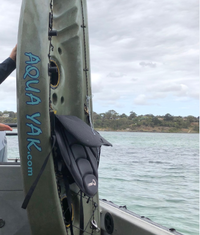 Disabled Surfers Association Ocean Grove was chosen by CBA Ocean Grove employees in recognition of the much needed services it provides to the local community. More than 13,000 current and retired bank employees donate a portion of their income to CommBank Foundation, with Commonwealth Bank contributing up to $2 million each year as well. The inspiring impact of the work undertaken by DSA was a crucial factor in it receiving the grant, said CBA Ocean Grove branch manager Ben Mumberson. “It’s important to us that we support local organisations like the Disabled Surfers Association. The support they provide surfers living with a disability is incredible,” Mr Mumberson said.